The variations that exist of the popular pico de gallo salsa are almost endless. Each cook has its own recipe and each place maintains a repertoire of picos de gallo that uses some of their local products. This preparation is one of the most originals for 2 reasons: requires very few ingredients and one of them is a fruit known as xoconostle – is similar to a prickly pear but it is less popular and it has a more complex flavor. 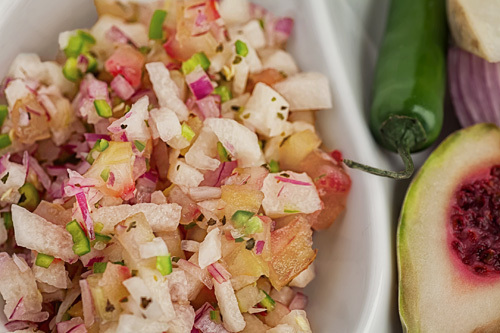 In the recipe the xoconostle is combined with serrano pepper, onion, jicama, lime juice and more ingredients that generate a salsa that is different, spicy and with a very interesting acidic point . It is perfect plain as snack it can also be used in a breakfast or in some main course of your choice. The preparation of this salsa is simple and it doesn’t require much experience. The only way of making this recipe is with xoconostle and it cannot be replaced for prickly pear. In this recipe we are going to use jicama, we recommend buying one that has a smooth skin because this indicates that is in very good conditions. In 10 minutes your salsa will be ready. Finely chop 1 serrano pepper, put it in a bowl and reserve. Peel 1/4 of a jicama and 2 xoconostles; then reserve. Dice the 1/4 of a jicama that was peeled and 1/4 of a red onion; upon completion put them in the bowl and reserve. Remove the seeds from the xoconostles that were peeled. Cut into small chunks the xoconostles with the ones you worked, upon completion put them in the bowl and reserve. Pour the dressing that was beaten in the bowl over the other bowl, where the xoconostle pico de gallo is. Mix very well the xoconostle pico de gallo with a mixing spatula. Recommendation: This salsa can be left resting in the fridge for about 15 minutes so the flavors integrate. Suggestion: Serve this pico de gallo in a clay plate accompanied of tortilla chips – it will look very appetizing. Variation: Another delicious preparation that uses the xoconostle is the Morelos style mole. If you need jicama this one is fresh and it has very good flavor. Prepare the pico de gallo in these bowls because they are very stable. Use a professional knife so you can cut the ingredients very easily.